What is Inbox Ace Toolbar? 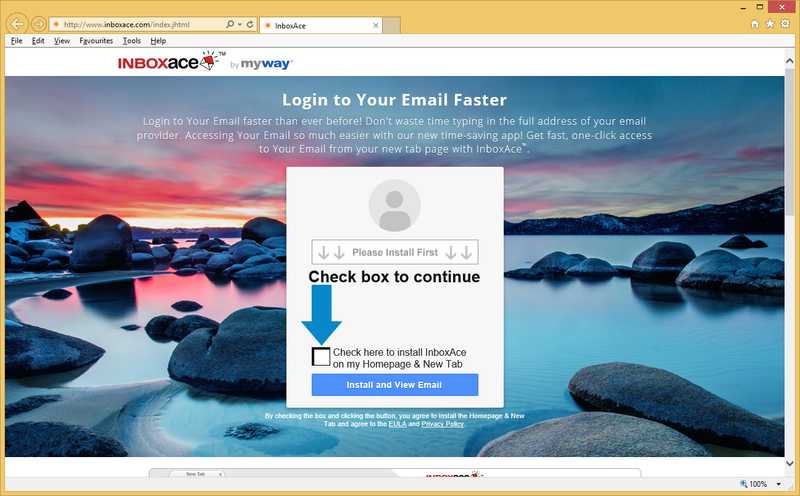 The potentially unwanted application, Inbox Ace Toolbar, was created by Mindspark Interactive Network, a company that has released plenty of similar apps. It is promoted as a program that can allow you to access your email accounts from one place. It may seem that this is its only purpose, but that is simply not true. The main goal of the software is to earn revenue for the company that developed it. That is why in addition to functioning as a toolbar, it also functions as adware. It exposes you to advertising data, causes redirects, and more. We urge you not to waste any time on it, and to terminate Inbox Ace Toolbar as soon as possible. How does Inbox Ace Toolbar work? Most unwanted apps use the bundling distribution method to spread online. Despite the fact that it actually has an official website, Inbox Ace Toolbar is no different. You may not remember installing it, because it entered your computer through other freeware. When you install freeware or shareware, you have to pay attention to every step of the setup. In the Advanced mode, users usually get presented with the so-called additional offers. These offers are pre-selected, so unless you specifically decline them, you add unnecessary applications to your system unwittingly. Be sure not to make the same mistake again and always deselect all optional components that you see in the wizard. Once inside, Inbox Ace Toolbar gets added to your browsers and appears under the address bar. It has such buttons as Gmail, Outlook, Yahoo! Mail, AOL Mail, Facebook, and some others. It also has a search box, which will bring you sponsored search results. The program may alter your browser settings including your home page and default search engine. It will also insert ads into all of your visited webpages. There is no way to verify which adverts are legitimate and which are not, so the safest thing to do is to stay away from all of them. If you wish to return your settings back to normal and eliminate the unreliable ads, you should get rid of Inbox Ace Toolbar for good. How to remove Inbox Ace Toolbar? You can erase Inbox Ace Toolbar from your PC and your browsers manually or automatically. Although manual Inbox Ace Toolbar removal should not be too complicated, we advise that you go for the automatic option instead. There are several benefits to it including the fact that using a malware prevention and removal tool will allow you to clean your system completely. The anti-malware presented on our page can help you delete Inbox Ace Toolbar and other unsafe files and programs. It can also protect your computer from other online parasites you may encounter moving forward. Alternatively, you can eliminate Inbox Ace Toolbar manually. You will have to uninstall the unwanted program from your system and restore your browser settings. More detailed instructions are presented below.